This is an incredible deal on a bulk 1000 round case of 44 mag ammunition. It’s some of the best hunting and personal defense ammunition you can buy new for the price point (it may not even have a competitor at this price point). 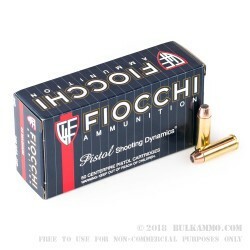 The 240 grain jacketed hollow point load from Fiocchi, with a brass case and a Boxer primer is among the best values you can find for a full featured hunting cartridge suitable for taking big game (where allowed by law) and for personal and home defense use. The performance of this round makes it ideal for personal defense where you don’t have an overpenetration concern and for hunting where allowed. Fiocchi has really got a winner on their hands at this price point for the viability of this round. It achieves a velocity of 1180 feet per second and a delivers 740 ft. lbs. of energy at the muzzle exit. NOTE: it is important to always check your local and state regulations for hunting before you blindly select an ammunition for the task. 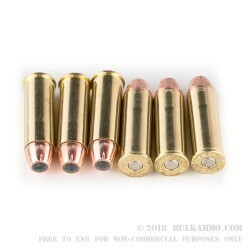 Some states require all copper projectiles for hunting; others will not allow certain handgun calibers to be used for hunting; while still others will require hollow points but won’t allow full metal jacket rounds. Please be sure to check your local and state regulations before selecting a dedicated hunting round. Q: I know this is listed under handgun ammo. 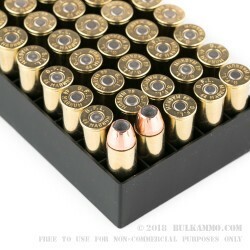 Will this ammo also work well in a Rugar ,44 magnum carbine and would this ammo be a good choice then for deer hunting in short ranges, say, under 100 yards? 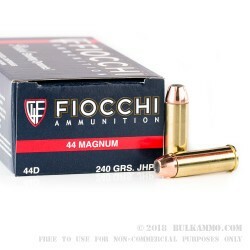 A: This Fiocchi 44 Mag ammo will shoot well in any firearm chambered in .44 Magnum. It would be ideal for deer hunting with a carbine at short range.